I have never heard someone say they didn’t like Bali. I’ve heard people rave and rave about how amazing it is. And when I ask them specific places to see, they immediately without fail shout out Ubud. You must see Ubud. It is the cultural capital of Bali, known for its artistic flair and creative spirit. Its the hub for famous photographers, writers, painters, musicians, and dancers. There was no question that I wanted to go there! So Ubud it is! I arrived in Bali around noontime and my friend Matt, from Nomadic Matt’s Travel Site, met me at the airport and we were on our way to Ubud in no time. He whipped out his guidebook and started showing me all the places we were going to go and all the things we were going to see. He traced our future route through the island telling me interesting tidbits about each place and why we’re going to go there. It was so amazing not having to plan a trip for once! A couple hours we made our way into Ubud. The streets were lined with paintings of rice terraces, Balinese dancers, and beautiful beaches. Photography galleries could be found on every street. Balinese women were furiously beading away in their shops. Wood carvings were strewn about the roads. I was surrounded by art and being that photography is pretty much my life these days, I was in heaven. Walking through each shop, we talked about everything we wished we could by for homes that we don’t even have. Paintings that we wanted to buy. Statues that belonged in a front yard somewhere. Vases that belonged in a future foyer one day. We were surrounded by so much beauty and talent. What a wonderful place to become inspired! Sounds like a great first impression to me! We’re looking forward to exploring Ubud as well. Glad to hear you enjoyed it so much! Can’t wait to read more about Ubud. I just booked a trip to Thailand and Bali for Feb 2011, and am starting to map out some places I might like to go. Sounds like this should make the cut. Hi! Glad to know you’re visiting a little part of my country :). Ubud is really nice, not as hip and happening as Kuta and Seminyak (if you’re into partying) but it’s definitely the place for arts & crafts. 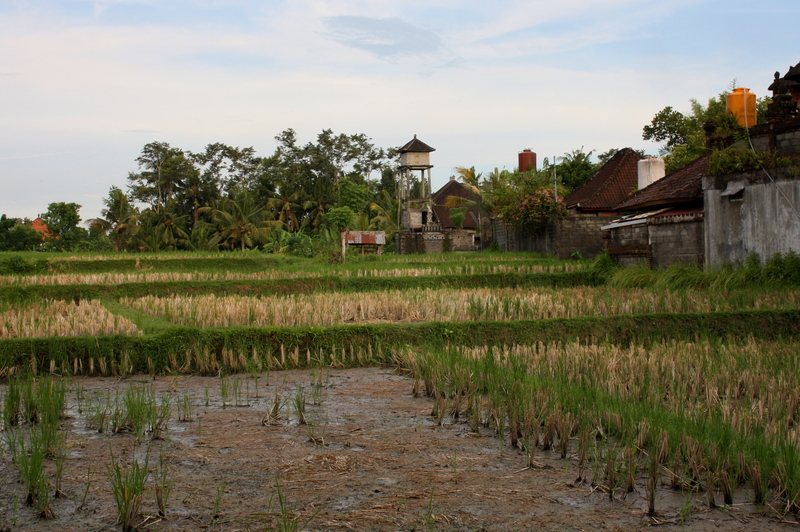 That little rice paddy in the photo looks familiar. Is it the one next to The Three Monkeys cafe?